15/01/2010 - Shane Archbold finds it a little hard to be inconspicuous on the track nowadays. The striking mullet wafting through the air behind him has seen to that. Given the impressive form the Timaru rider has been in since shunning the scissors two years ago, it’s hard not to draw comparisons to Herculean figure Samson. “It’s just part of me now, I can’t get rid of it,” Archbold said. “It’s easy to spot, especially on the world scene. I won a World Cup in November and it’s sort of made me a marked man – it’s not hard to know where I am when I’ve got this dangling out the back. Archbold sparked concern during Thursday night’s Gore to Invercargill road race when the mullet appeared to be missing, with many initially fearing the worst. “It’s been quite a hard week on the boards and on the road,” he said. “It’s always good to end the week with some racing … it can only make us stronger. 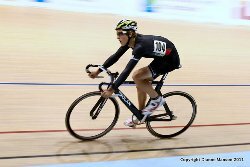 In the elite men’s super sprint at tonight’s ILT New Year Carnival, Archbold ignited the crowd with a scorching final lap to steal victory from Auckland’s Aaron Gate. The dynamic duo was at it again in the 8km endurance event, this time with Gate snatching the hard-earned glory. Marc Ryan struck with 14 laps remaining and, once joined by Gate and talented Christchurch rider Alex Frame, the trio settled into team pursuit mode, forcing the chasing bunch to lift its intensity considerably. In a gutsy effort, Archbold snuck up on the trio with just three laps to go and quickly took the lead before losing the ensuing battle with Gate in the final few metres. “I was just a bit far back when they broke away so it was hard for me to charge around 10 people. Everyone sees you coming and by the time you get to the front you’ve already done 20 metres so it’s always hard like that,” Archbold said. “It’s a good buzz when the race is that close. You always want to win them but as long as the crowd get what they want out of it and we get good hard racing, that’s all you can hope for. “I’ve been to this carnival quite a few times now and, like any event run by Cycling Southland, they’ve always had good fields, strongly contested racing and good crowds time and time again. Invercargill’s Matt Dodds claimed the 2010 ILT Wheel Race trophy with a gutsy performance, holding off strong challenges from Tom Beadle and a fast-finishing Archbold. “It’s awesome. There was a bit of luck involved with all that … sometimes the handicap works for you,” Dodds said. Invercargill veteran Wally Kopae produced a brave performance riding off the front, clinging to the lead until the final lap. In the sprinting stakes, a talent-laden New Zealand invitational team comprising Sam Webster, Ethan Mitchell and Nathan Sneddon took on hometown heroes Eddie Dawkins, Matt Archibald and Sean Fox. Despite the deafening roar of the crowd spurring them on, the Southland trio were narrowly beaten. 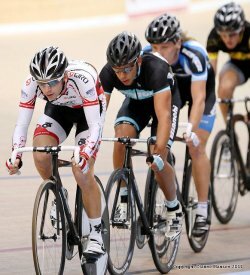 Dawkins later repelled a tenacious challenge from Auckland’s Webster in the keirin final. Dunedin’s Katie Schofield secured the elite women’s 1500m scratch ahead of hometown favourite Sequoia Cooper and held off highly-rated New Zealand representatives Stephanie McKenzie and Henrietta Mitchell to win the 1000m scratch. 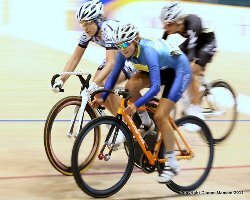 Gemma Dudley, of Wanganui, snatched the honours in both the elite super sprint and 4000m scratch events. Te Awamutu’s Brittney Thompson proved untouchable in the women’s 515m scratch, followed by Laura Gretton and Invercargill’s Erin Criglington. In division one, Dunedin’s Justin Stott won the men’s 2km scratch, while Christchurch’s Tayla Harrison was unbeatable in the 5000m scratch. Gretton, of Te Awamutu, won the women’s 1500m. 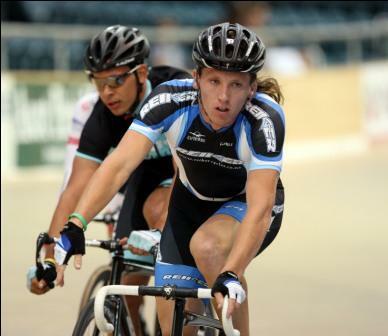 Ryan Miller, of Timaru, dominated division two, winning the 2km and 3km scratch events. In the 1500m scratch, the non-qualifiers proved their worth with some closely contested battles. McKenzie won the elite women’s race ahead of Mitchell while Invercargill’s Cam Karwowski won the elite men’s event. Christchurch’s Samuel Friend beat Colin Horton, of Invercargill, to the line in the combined division two men and division one women’s fixture. Fellow Cantabrian Brad Tuhi blitzed the field in the division one men’s event, followed by Invercargill’s Jamie Culling and Matt Zenovich. In the hotly-contested junior ranks, Nick Ralston, of Mid-south Canterbury, secured the coveted OJ Henderson Memorial Trophy. “I’m really stoked,” he said. “I haven’t been racing that well – I just haven’t found my legs. Invercargill’s Bronwyn Graham won the under-15 1000m and 2000m group handicap events, Hamish Beadle took top honours in the division one 515m scratch and Christchurch’s Eden Ronald claimed the division two equivalent. Laura Murton, of Christchurch, won the under-17 girls 750m derby, Invercargill’s Jenny Muhl reigned supreme in the 6-lap handicap, Michael Culling, also of Invercargill, secured the super sprint title and Chad Elliston, of Counties-Manakau, claimed the 8-lap group handicap and 2km points race. In the Para-cycling tandem time trial, Phillipa Gray and Laura Thompson produced a remarkable time of 1min 13.68sec, slashing 5sec off their personal best. The time was just 1sec shy of the New Zealand record Gray, who is vision-impaired, set with her previous team-mate at the 2010 national championships. The pair was training under the experienced eye of Invercargill’s Nick Harris to contest the 2012 Paralympics in London. “You can’t ask for a better coach,” Gray, who has ventured south from Thames to tap into Harris’ expertise, said. He was impressed with their effort, especially considering the new combination was only formed a few weeks ago. “I have no doubt they will set a new record at the New Zealand championships,” Harris said. The duo leaves in March to compete at the Para World Championships in Italy. Cycling Southland’s New Year Cycling Series concludes on Sunday with the Ascot Park Hotel Criterium from 11am. For full results and video from tonight’s New Year Track Festival click here.